Research shows that hibernating for long stretches of time, though it feels mighty compelling, isn’t really meant for humans. “Too little sunlight is stressful and effects our emotional and physical wellbeing, making us vulnerable to being pessimistic and fatigued,” says Sharp. Also, it throws your circadian rhythms way off, which can have a detrimental ripple effect on your health. Circadian rhythms are responsible for more than just your sleep/wake cycles — they keep everything from your moods to your digestion in check. Exposure to daylight, even in small amounts, can help keep your circadian rhythms in check, but it can also do so much more. Here’s five reasons to suit up and head outside — even though it’s freezing out. Natural daylight does a bang-up job of raising your serotonin (one of your body’s feel-good chemicals) levels. “Physiologically, we know serotonin levels in the brain are lowest in winter. Going outside can increase positive mood and alleviate depression,” says Kathryn A. Roecklein, Ph.D., associate professor, Department of Psychology at the University of Pittsburgh. Roecklien conducted a study revealing how light therapy can help those with seasonal mood disorders. “We know that inside light levels are lower than outside light levels. And we know winter light levels are lower than summer light levels. So being inside for a majority of the winter may be a double strike in terms of getting the light we need for energy levels, alertness, mood and cognitive functioning,” she explains. Vitamin D promotes calcium absorption (and thus boost bone health), reduces inflammation and promotes immune function. It also helps lift serotonin levels and keep your moods even during bouts of cabin fever, says Sharp. He recommends bundling up and taking in at least 10 minutes of sun during a brisk walk to get your dose. If you’re going out for that walk, save the texts and phone calls for when you’re back inside. 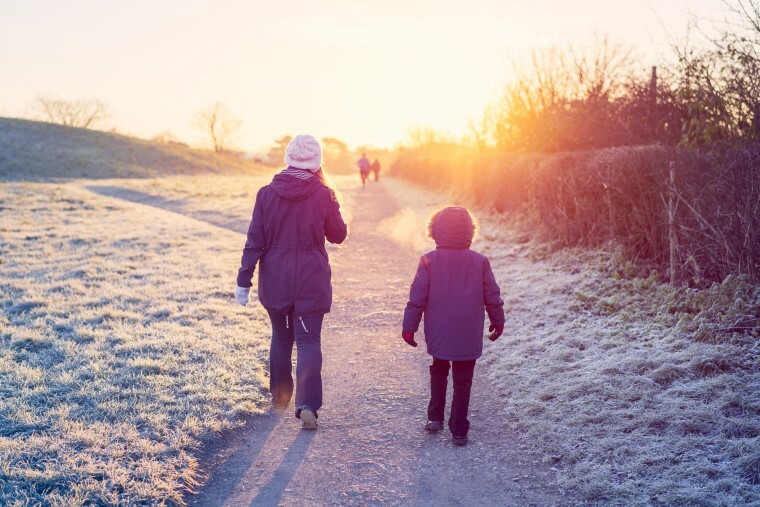 A brisk mindful walk outside while being present and noticing your experience, or exercise if you can stand it, will boost dopamine levels, which can also stave off the cold weather blues, says Sharp. One Japanese study measured the ability of “forest bathing,” or a short, leisurely spin around a forest, to improve immunity. Researchers found that forest bathing decreased stress hormones and increased intracellular anti-cancer proteins. Plus, exercise, even walking out in the cold, may help keep illness at bay because it flushes bacteria out of your airways and lungs, according to MedlinePlus, a website from the U.S. National Library of Medicine. Could you have SAD? If, year after year, you’ve noticed yourself feeling really depleted and down come the annual deep freeze, you might have SAD. To help you feel better, Dr. Sharp recommends talking to your doctor and trying a 10,000 LUX lightbox for 20 minutes in the morning. In the meantime, you need a quick mood boost, getting one could be as simple as putting your boots on. Don’t forget the toe warmers.